There isn’t much liberals will let stand between them and advancing their agenda. Credibility? Nope. Integrity? No way. Friends? No. Family? Maybe. OK, there actually isn’t anything I can think progressives won’t toss aside, or into a woodchipper, if it became an inconvenience or an obstacle. This week was no different. Oh, they had him. They had him so dead to rights. The prison cell was reserved and the marching band was warming up. The only problem was, it was a lie. 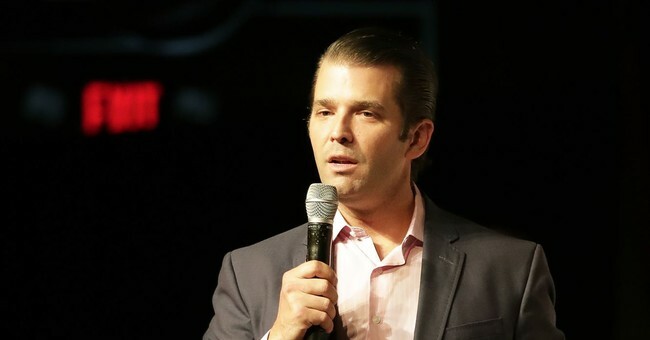 News organizations and Trump-hating journalists (which is just about all of them) were sexually aroused at the prospect of this latest, greatest smoking gun – that Don Jr. lied to Congress about…the timeline of discussions regarding a possible Trump Tower being built in Moscow. OK, not exactly the most exciting of charges, and certainly not conspiring to “steal” an election, but Democrats don’t really care how they destroy someone, they just want them destroyed. NPR hadn’t bothered to check the whole transcript in the research, writing, or editing phases of their “reporting,” and neither did any of the so-called journalists who’d help spread the fake story once it broke. It fit perfectly with the liberal narrative of the Trump family being Russian puppets – no fact-checking was necessary, it had to be true because they’d wished for it be. But the note should have been a complete retraction, as the entire premise of the story was wrong. Everyone who read it in that 5-hour window, before the “note” was added, was lied to and believed that lie, likely spreading that lie to others to this day. The lie always beats the truth with people who desperately want to believe it. You can add this to long list of bogus stories and narrative-enforcing lies that were wished true by reporters only to be proven otherwise after they’d spread and done their damage. And that’s really the point of these “fake news” stories, why they aren’t caught in the editing process, why no editors or publishers question stories that so perfectly encapsulate what pundits hope for but for which there is zero proof. It HAS to be true because they WANT it to be true. All the James Clappers, Jim Comeys, Max Boots, Jennifer Rubins, Bill Kristols, John Brennans, Hillary Clintons, Barack Obamas, every elected Democrat, progressive activist, and CNN and MSNBC employees in the world haven’t been able to collectively wish evidence into being in more than 2 years of trying, but that hasn’t stopped them and it never will. Truth is not their friend, it’s an obstacle, an obstruction to be overcome. It’s no coincidence that there have been scores of false stories needing correction and retraction and none of them, not one, had errors that were favorable to the President. Chance should dictate at least some of them would go the other way, but “errors” miraculously became a one-way street. Donald Trump is not a perfect man, obviously, nor is he a perfect President. No President ever has been or ever will be. Yet with the hatred fueling liberals’ very existence, it’s easy to project horns on anyone’s head. When that is your reality, a little thing like the truth isn’t going to get in your way. This week was no different, and neither will the next.